A comfortable room awaits you. 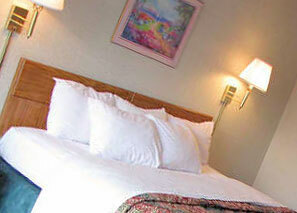 We have rooms with 2 double beds and rooms with 1 king bed, each type available in smoking and non-smoking. All rooms are available for the same low rate, so you don't have to sacrifice comfort to save money. Exterior access means that a balcony with a view is just outside your door. Our unique location allows you to choose your view. A room on the front side of the hotel will provide a view of the city life of downtown Asheville, while a room on the back side provides a spectacular view of the Blue Ridge Mountains. Each room has a TV, radio alarm clock, hair dryer, coffee maker, microwave and refrigerator. There is free wireless internet available in each room.